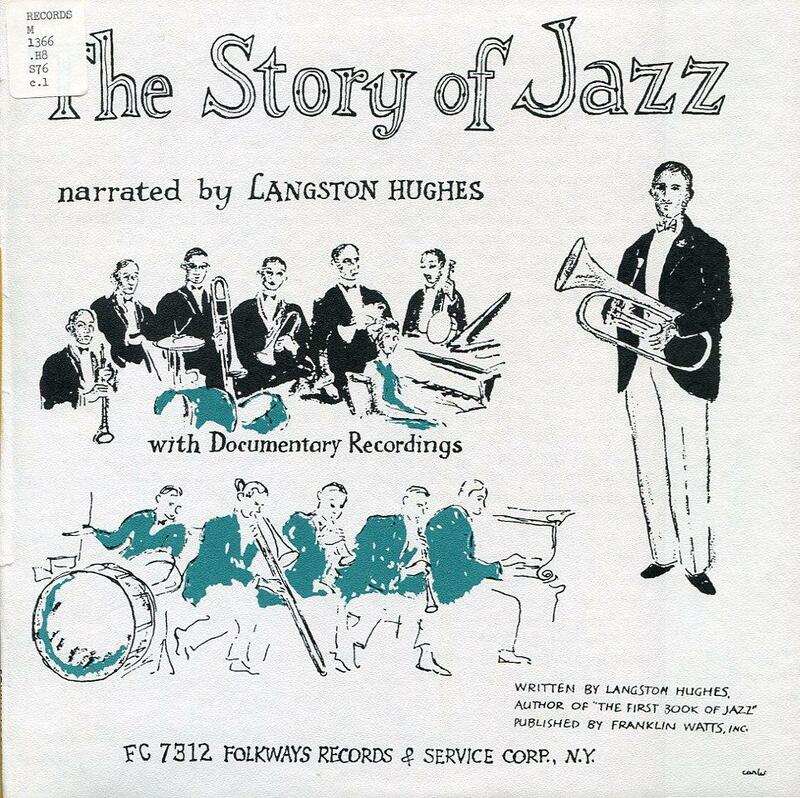 "The Story of Jazz, conceived and narrated by Langston Hughes. 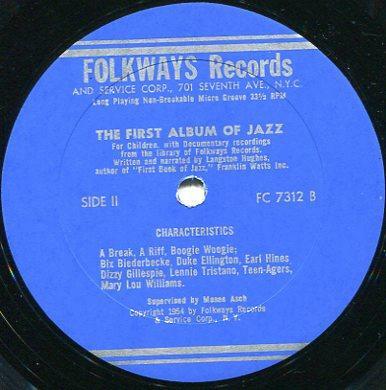 Folkways FP712. 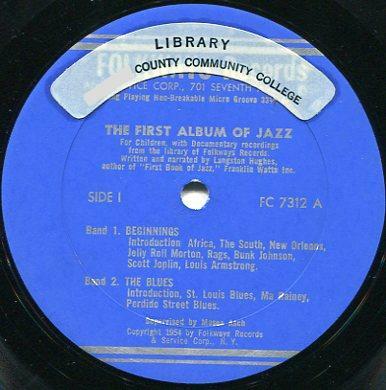 As Langston Hughes tells his story of jazz, authentic recordings illustrate the rhythmic drums, the field hollers, the French songs and bands and early jazz of New Orleans, the blues, ragtime--everything that has gone into the making of jazz. 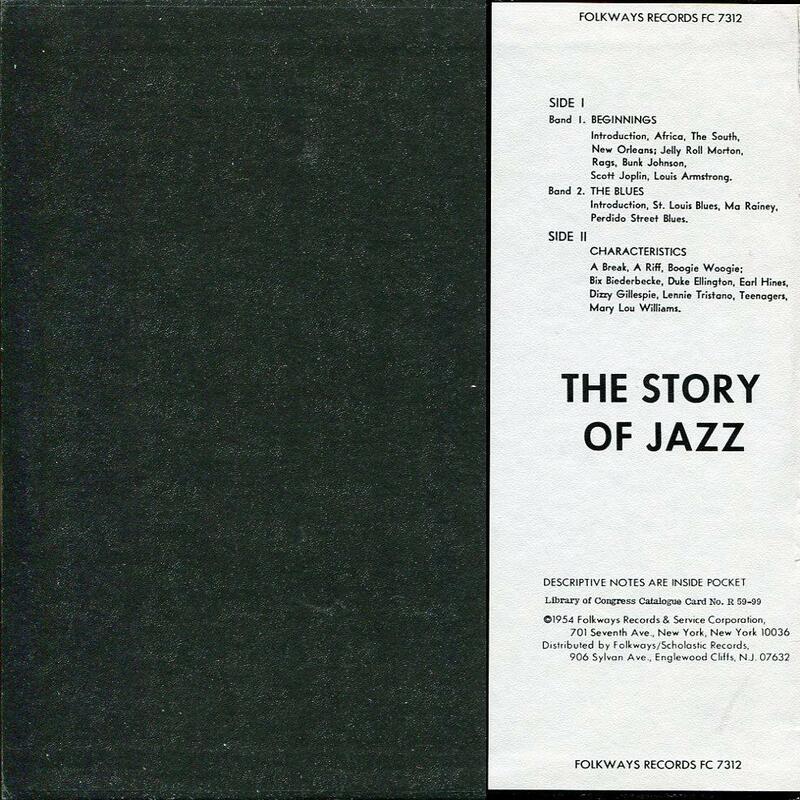 A vivid presentation, based on The First Book of Jazz." Hughes recorded several albums for Moses Asch's Folkways label. Most of them are recordings of Hughes reciting his poetry such as The Dreamkeeper and Other Poems by Langston Hughes (1955), a collection that had appeared in book form in 1932 aimed at a children's market. 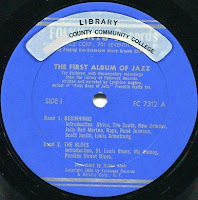 One of his first records though, was a 10" children's record meant as a companion to The First Book of Jazz entitled The Story of Jazz (1954). 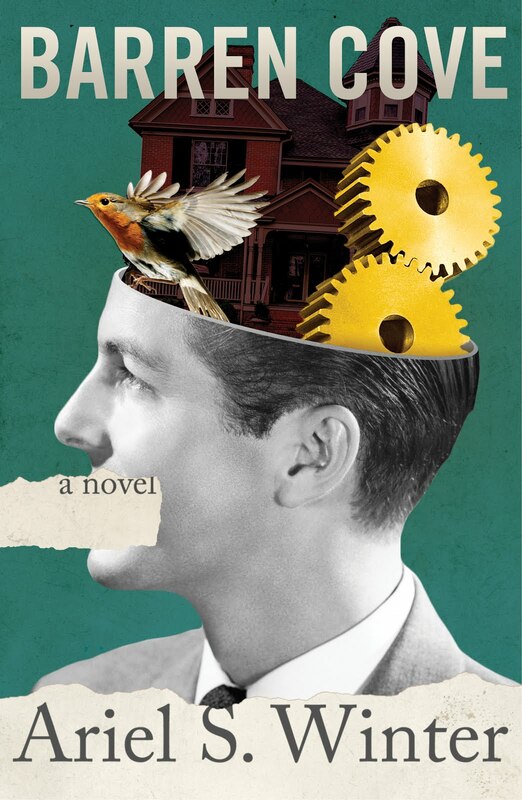 As the above advertisement promises, Hughes in a relaxed, self-confident narration weaves the story of jazz with the music itself. 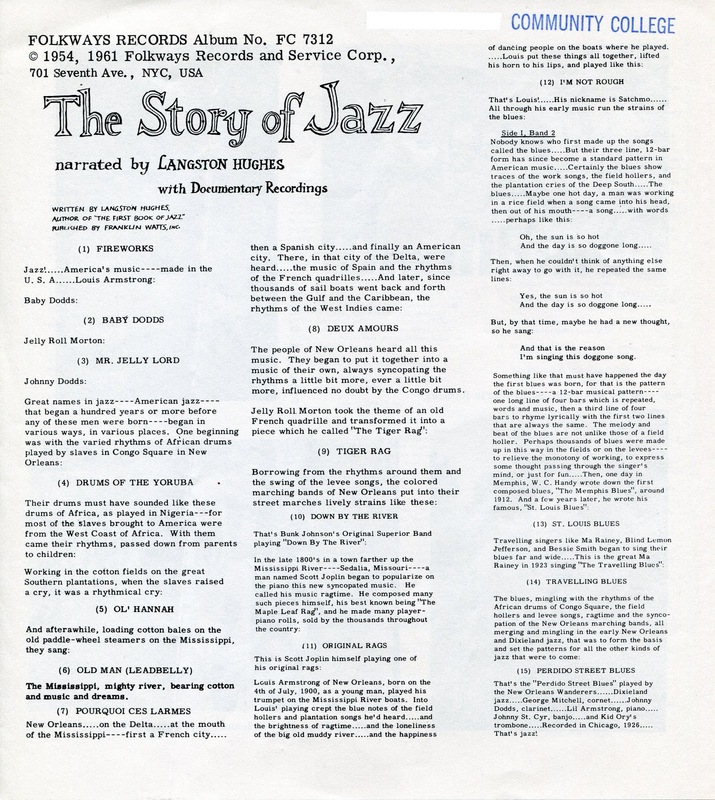 Below are links to the three tracks that comprise The Story of Jazz. The links should take you to a download page on the file sharing site 4shared. This is the first time I am using 4shared, so please let me know if you have any problems downloading the tracks. To create the WAV files, I simply played the vinyl record straight through and captured the sound using Audacity. I made no further alterations outside of breaking the recording into the three tracks as listed on the album's label. 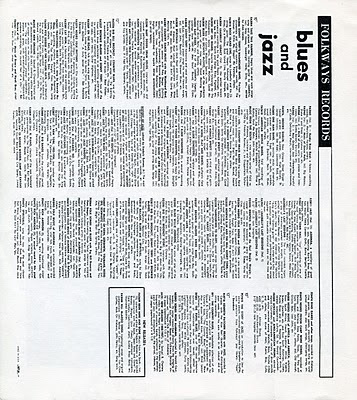 The liner notes contain the complete text of Hughes's narration along with photographs and music credits. In order to read along, click on the images below to see them original size. 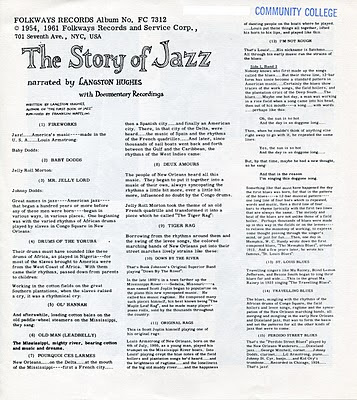 The Story of Jazz was successful enough that Hughes went back and made a companion record to his earlier book The First Book of Rhythm called Rhythms of the World (1955). 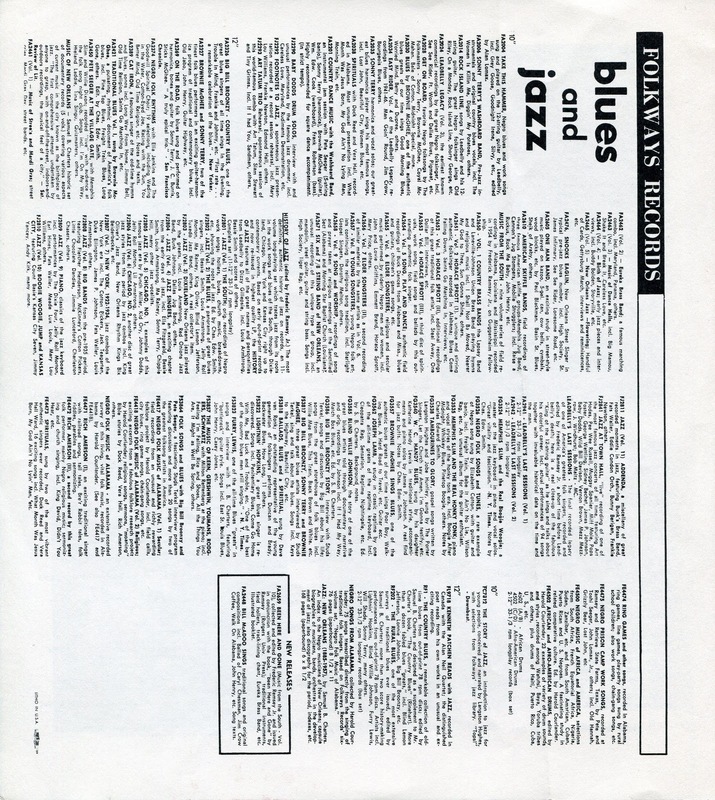 I have yet to get my hands on a copy of Rhythms of the World, but if the response for The Story of Jazz is good, I'll try to post Rhythms of the World as well. 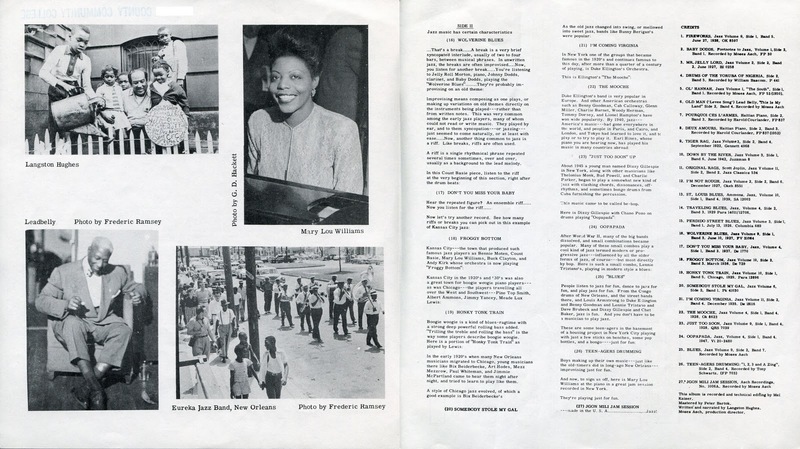 For now, an excerpt from Rhythms of the World appears on the Smithsonian Folkways CD The Voice of Langston Hughes. Please let me know what you think. 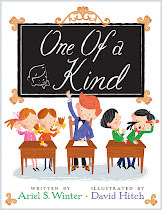 UPDATE (10/18/2011): Several of you have written to let me know that the audio files above are no longer available through my links. 4shared only stores files for a limited amount of time after long inactivity. I've been meaning to get these files back up somehow, but haven't had a chance. 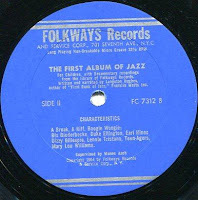 For those really interested, Smithsonian Folkways will make a custom on-demand CD of any album in their catalog. 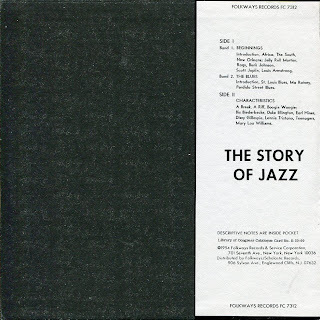 You can buy "The Story of Jazz" on their website here for $16.98. Hughes's other children's record to accompany The First Book of Rhythms called Rhythms of the World can also be ordered as a custom on-demand CD on their website here, also for $16.98. All images and recordings are copyrighted © and owned by their respective holders. What a great entry! I was excited to share these recordings with my kids, who are a few weeks out from seeing their first official jazz concert (their uncle was a jazz musician so they have had a little exposure), but when I clicked on any of the three links, I got a message from 4 shared file sharing: The file link that you requested is not valid. Do you think you could take a look on your end? Thanks for your interest, susie87. Please see the update above. If you don't want to pay for the CDs though, check back periodically as I do have this on my long list of things to do.